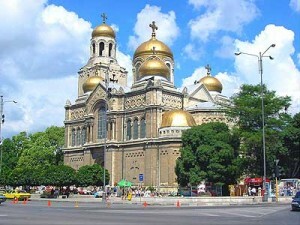 Varna is the third largest city in Bulgaria. It is called also the Sea Capital of Bulgaria and is famous for sea tourism and broadly known Sea Garden. This city is situated on the North and West coast of the gulf of Varna. Sea waves are petting the town and on the night the view is amazing. The guests of Varna could touch the warmth and cheerfulness of its citizens, visit the Evksinograd residency, Sea Garden and the famous Fountain of Sirens. An important attraction is the Dolphinarium. In Varna every year a lot of cultural enterprises are taking place such as International Jazz Festival, Folk festivals, the Movie Festival “Love is madness” and the Week of the Sea. The city is an attractive center for youths because except its beauty Varna offers and high valued universities. A lot of temples and theaters also contribute to the cultural and ethical lifestyle of Varna citizens. The city is a result of interlacing of the history with the modern life. Varna has been chosen several times the best city to live in. The many investments have reduced the unemployment to a minimum level which is a sign of the high economic potential of Varna that would continue developing in future as well. The city transport is convenient but delays always happen. That’s why if your visit to Varna is short you could rent a car. Nowadays the best quality and prices in Bulgaria are offered by the professionalists in iRent. Our site is available to anyone - www.irent.bg. The company possesses a large car-park with vehicles from each category: economic, luxury, jeep, minivans and many others. The many services and rebates distinguish iRent from other rent a car companies as well as the fact that you can get a car for 22 euro per day, the insurance and road assistance tax included. You can also purchase a GPS equipment car and a child-seat if needed. Our drivers are also available for purchasing. They are highly qualified and guarantee comfort and safety. Irent has parking areas on each airport and you won’t have to look for a place to park your vehicle. Parking areas are guarded round the clock and are provided with cameras to guarantee the safety for your car. More hard-headed of you can use the loyal customer service in order to receive extra discounts. Irent cares about people who must regularly travel by plane. For their comfort we have “Meet and Greet” service. We will welcome you at the airport preventing you from spending time, money and efforts in finding a transport. Customers can rent a large number of vehicles for receptions, private visits, delegations. If you like to use this service we will be glad to make you a special offer. While travelling you can hire one of our drivers. He will take care of your safety and you will relax and enjoy your trip and holiday.